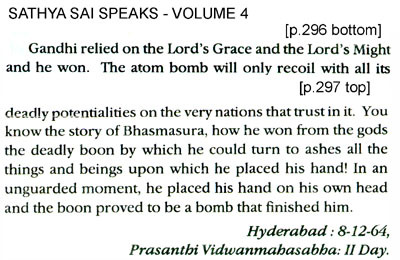 As the scans of his discourses here show, Sai Baba has repeatedly condemned both the possession of atomic weapons and those countries which develop them, calling their leaders 'moral dwarves'. Despite this, he befriended for many years the man who was known as 'the father of India's atom bomb', Dr. S. Bhagavantam. (Scientific Advisor to the defense Ministry). Later he supported the government of Vajpayee, which revelled in the explosion of Indian nuclear devices, and even now in 2006 he made the man who developed the first rocket delivery vehicle for nuclear weapons, India's President, A.J.P. Kalam, the guest of honour at his 81st birthday celebrations in Puttaparthi. Sai Baba has extended his full support to all these 'nuclear' governments! In his Janus-faced way, Sai Baba is a Dr. Jekyll in word and a Mr. Hyde in action! Only blind faith devotees cannot realise this. There are adherents of Sai Baba who believe that he is doing the "Task" he set himself, to set India's house in order (before he sets the entire world straight! ), and thus is trying to influence the government. Yet he has promised he would unfailingly raise India to its supposed former moral and spiritual glory (i.e. very ancient 'Bharatiya' culture which he claims was prevalent in far gone days, thousands of years ago). He boasts that his will is indomitable, he is omnipotent! What international observers report, however, is a continual decline into rampant militarism, major political and social corruption, religious strife and mass killings of Muslims, bombings of Hindus and continual (sometimes hardly reported) murders of Dalits, brides, Christians and infanticide of girl babies. Meanwhile, the vast poverty is not alleviated, huge city slums proliferate, ever more rampant AIDS epidemic and some of the world's worst crime and corruption in all sectors, and the prostitution slave trade is still booming. UNICEF states "an estimated 246 million children are engage in child labour. Of those, almost three-quarters (171 million) work in hazardous situations or conditions". India is the largest example of a nation plagued by the problem of child labour. Other estimates (Human Rights Watch 1996, 1) cite figures of between 60 and 115 million working children in India -- the highest number in the world . As early as 26 June 1946, when addressing a public gathering in Bombay, Pandit Jawaharlal Nehru, soon to be Indias first Prime Minister, said: "As long as the world is constituted as it is, every country will have to devise and use the latest scientific devices for its protection. I have no doubt India will develop her scientific researches and I hope Indian scientists will use the atomic force for constructive purposes. But if India is threatened, she will inevitable try to defend herself by all means at her disposal." After Nehru's death, a reprocessing plant and the CIRUS research reactor, began operating in 1960. The first Chinese nuclear test was in 1964, barely two years after India lost the war with China and the "peaceful nuclear explosion" of 1974. 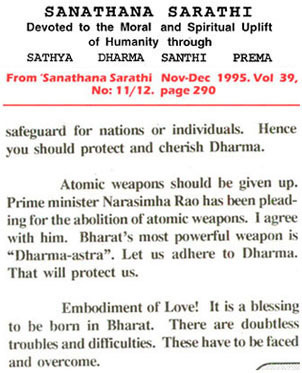 The Hindu nationalist Bharatiya Janata Party came to power in March, 1998, with Prime Minister Atal Bihari Vajpayee, who had already been a devoted follower of Sathya Sai Baba for two decades (but evidently no follower of his 'human values' like non-violence!). On 11 May 1998, the Buddha's birth anniversary, India tested three nuclear devices. Two days later, two more tests were conducted. 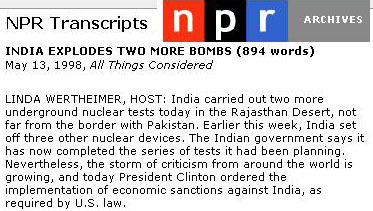 After these tests, the Indian Prime Minister Atal Behari Vajpayee triumphantly announced that India was now a Nuclear Weapon State. Vast crowds celebrated this achievement with great enthusiasm in India's major cities. 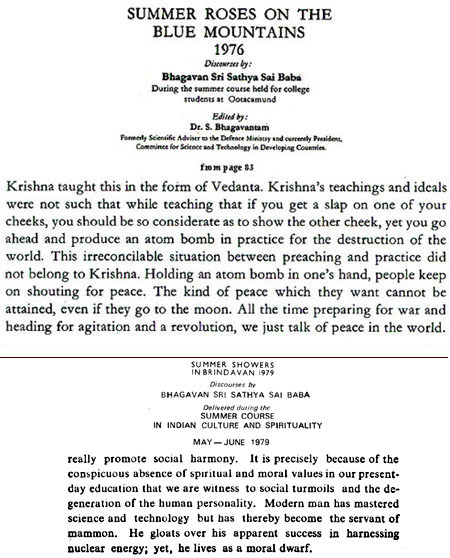 THE NEWS WHICH SHOCKED THE WORLD - WHEN SAI-DEVOTEE P.M. ATAL B. VAJPAYEE BOASTED OF THE BOMBS! 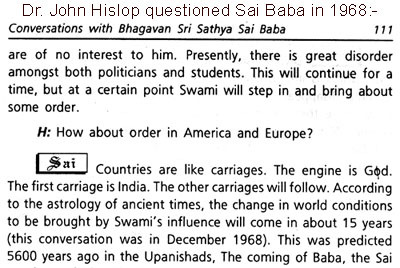 See the news which shook the worlf when India's Prime Minister - Sai devotee V.J. 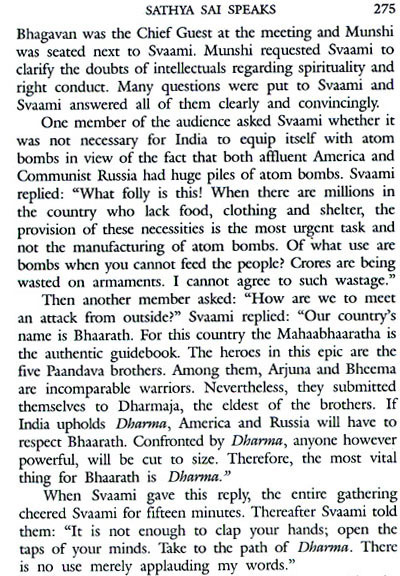 Vajpayee - boasted of the bombs!